Home / News / Devan Integra in Papua New Guinea! 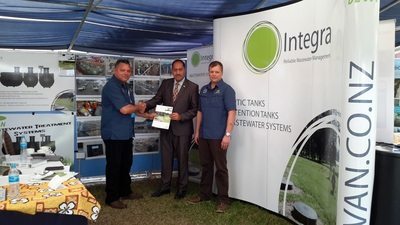 Devan Integra Wastewater systems were on display last week in Papua New Guinea! Our agents Kim and Clive from All About Drains manned a trade stand at the Pacific Water Conference and Expo. This yearís theme was wastewater issues in the pacific and included attendees from National water boards of Papua New Guinea, Samoa, Fiji, Solomon Islands, Niue, Tonga, New Caledonia, Cook Islands and Vanuatu.